W J Horn (centre, with stick) and family, at his 80th birthday party. Youg Bill sits in front row. Actors rehearse for an early production at Brickwall Farm. WC Horn on left. C B Purdom with case. Could it be young Bill on right? 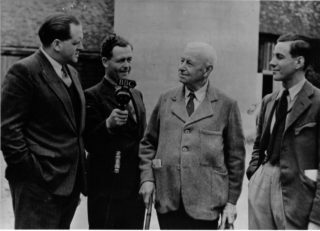 A little while ago I was asked by Mr Richard Busby if I could give him any details of life in the area now occupied by Welwyn Garden City, in the period immediately prior to the coming of the Garden City. I suggested that probably the best thing to do, would be for me to record certain of my recollections on tape and then he could choose from that tape any things which he thought would be of interest to him. This is then the tape. I’m afraid the recollections may be at times disjointed, but recollections are like that; they don’t always come in chronological order, but I’ll do my best. I’ll go back really to the time immediately after the First World War. Things in England were beginning to get back to normal. Demobilisation was proceeding apace and the men, those that were left of them, returning steadily to their old jobs on the land. We noticed that particularly in our area on the farms. It was good to see the men again, because we had to live rather in a makeshift sort of way, during the period that the war was on. Women played their part, and did their best, but there were certain heavy jobs, of course, which they were unable to manage, and those like myself, who were below military age then, we did our best. I acted as a cowman during that time and my father used to drive the traction engine which did the threshing etc, so as I say, it was nice to see the men back again to begin to get things back to a more efficient and normal way of running. The Welwyn Garden City area in those days was divided roughly into farmland and woodland. The area north of the old Luton Dunstable line was occupied by Sherrards Wood, part of which is still in existence. And apart from a small section of in which had been cut out for pit props during the war, it was a very beautiful unspoilt patch of woodland. 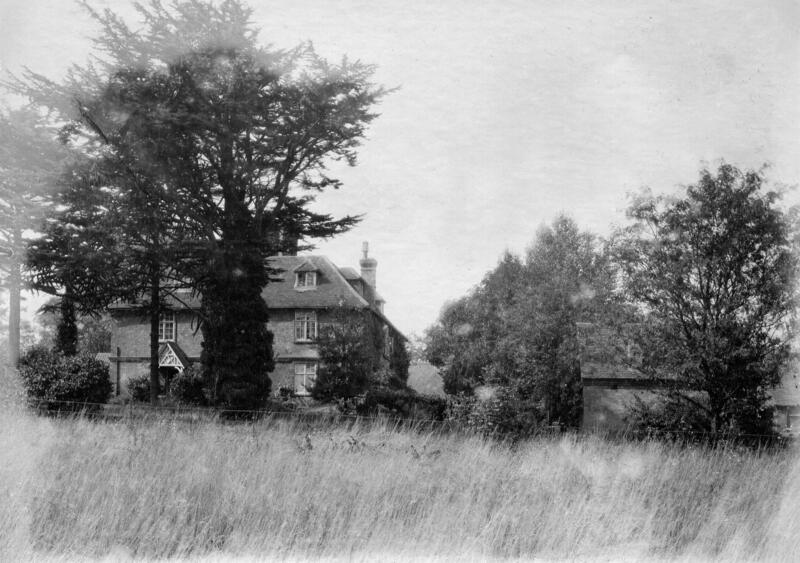 On the north-east corner there was a farm know as Digswell Lodge Farm (see picture), which was farmed by the Lyle family, and that was owned by Lord Salisbury. Sherrards Wood was owned by Lord Desborough. I’m not quite sure about Digswell Lodge Farm, whether it was owned by Lord Desborough or Lord Salisbury. At any rate, no matter. 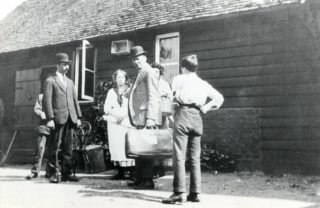 East of the main line was Peartree Farm, which was owned by Lord Salisbury, and farmed by a Mr J Hunter, who was a Scotsman whose father had come down and started farming there, in the latter years of the last century. On the south-east corner we had Woodhall Farm, which was also owned by Lord Salisbury and was farmed by the Peart family. I don’t think they were any relation to the present Minister of Agriculture. On that point I’m not sure. And then to the west of the area we had Upper Handside, Lower Handside and Brickwall Farm, which were owned by Lord Desborough and farmed by my family, the Horn family. Mr Busby has asked me if I can, in these recollections bring in any part played by my family. So forgive me at times if I seem to dwell on certain of their activities, and what they did. The farm at that time, which was farmed, was about 640 acres in extent. It was bounded on the north by the Luton and Dunstable railway line, on the east by the Old Great Northern Mainline, on the west by Brocket Park, and also by the road which led from the Great North Road down to Lemsford Village, and on the south by a lane which led from Lemsford village to its junction up Tinkers Hill and to Stanborough Lane. The farm was largely arable, but there was also a herd of dairy shorthorns, and the family went in for breeding pedigree shorthorns, at which they had some success in local shows. At the time where I am commencing these recollections, the Horn Family resident in the area consisted in Upper Handside Farm of my grandfather old W.J Horn, who was then just over eighty, and had recently retired from the active running of the farm (see picture). He was a great old character, a County Alderman, a Justice of the Peace, and we all treated him, not with fear, but with great respect. And he always said that he hoped no member of family would ever appear in a court over which he presided. The younger members amongst us were always a bit scared that we might do something or other which would land us in court, and that Grandpapa would have to retire while the court was being held. Fortunately, no such thing ever happened. He was a man of, I would say, an almost puritanical outlook on life, with high moral values, and very great integrity, and I always look back on the memory of him with very great respect. Living with him in Upper Handside Farm was my uncle J B Horn, Uncle Jack, and he was a batchelor, and his sister Mildred, my Aunty Mit. Over in Brickwall Farm on the Great North Road, lived my father W C Horn, who later on after the Garden City came, was to become quite a leading figure in public life (see picture), becoming, as he did, Chairman of the Urban District Council, and a magistrate etc. My mother May, and myself, who was then a young lad in his late teens. We employed roughly in those days about 20 men on the farms, and the main families were the Crawley family, the Lines family and the Wilmot family. There were also others – the Holdens and the Taylors also were the big family. On the Lines was foreman in those days, old Tom Lines, and his son Fred was chief cowman, and Fred’s brother Bert used to drive the traction engine for driving the threshing machines etc. Of the Wilmott family, Fred Wilmott was the shepherd, in the days when we kept sheep, but we hadn’t kept sheep for a good many years. The Taylor family were, generally speaking, expert ploughmen, and old Tom Taylor and George Taylor used to scoop the pool at the ploughing matches around the district year after year. Handside Lane in those days, was a narrow winding line, flanked by high hedges, following roughly the line of the existing Handside Lane. Bridge Road was a cart track, and the wood used to come right down to the edge of it. It led, much as it does now, down to the railway line. 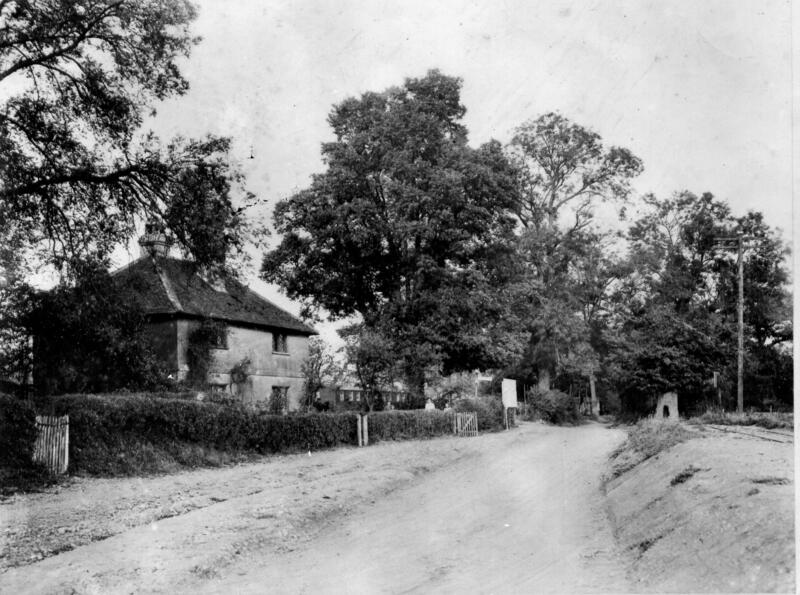 Brockswood Lane was also a cart track, again following roughly the line of the existing road and at the junction where Handside Lane met Bridge Road and Brockswood Lane, was Handside village, which was just a collection of cottages, some which are in existence today and some have been pulled down. There were no shops or anything there and somebody described it once to my grandfather, in the words, he thought Handside Village was the last place which God created, and he never quite finished it (see picture). Water used to be drawn up with a bucket…and that was the sole water supply for all the cottages. As for the water supply, there was a well just on the corner, in the intersection of Bridge Road, not Bridge Road, sorry, there was a pond there, the other side there was a junction of Brockswood Lane and Handside Lane. Water used to be drawn up with a bucket from that and that was the sole water supply for all the cottages. The sanitary arrangements were provided by earth closets at the end of the garden. In the two houses, Upper Handside and Brickwall Farm they were comfortable homes but we had very few of the amenities which are considered necessities today. The water supply came generally from wells or springs. In the case of Brickwall it came down through earth pipes, from a spring in the meadow which now comprises the golf course and down to a tank below the house and from there it was pumped daily to tanks at the top of the house and this water was used for washing etc. Drinking water supply for Brickwall, was obtained from a very deep well, nearly a hundred feet deep, which was just near the back door and a big wooden barrel was let down this on the end of a rope and wound up with the water in it, probably once a day, once every other day, according to requirements. This page was added on 29/07/2009.